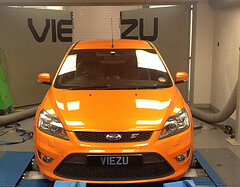 Viezu and our global dealer network we are honoured to offer Ford Focus ST tuning and Ford Focus ST ECU Remapping. Ford, the pioneers of the motor car are such a popular and practical brand that they deserve the best in engine tuning and ecu remapping technologies, in which Viezu really hits the mark. When it comes to Ford Focus ST tuning Viezu are indeed the world leaders. Our dedicated team of ecu remap software technical specialists make all of our Ford Focus ST tuning maps in-house. Viezu offer full custom Ford Focus ST tuning and upgrade packages, tuning can be custom tailored to ensure we meet your requirements, and can include performance upgrades including intercooler, injectors, turbo upgrades, air filterds and more. If you’re after an increase in throttle response and performance from your Ford Focus ST tuning, our prestigious Ford Focus ST performance tuning will seriously improve the drivability of your Ford Focus ST. Viezu have over 400 dealers around the world, and operate in over 42 countries.